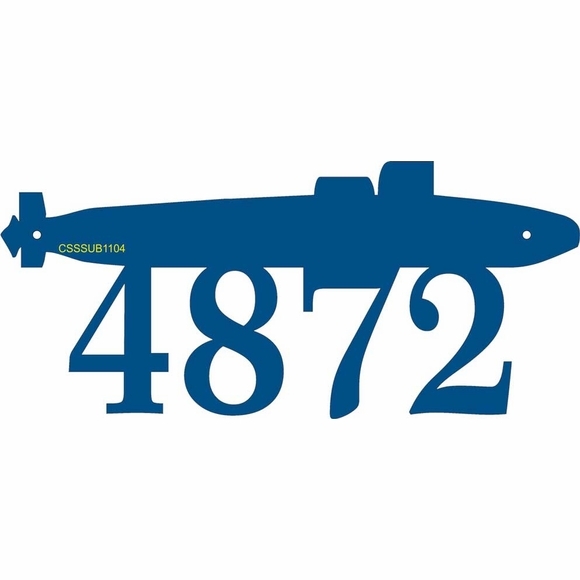 Personalized naval theme address sign includes unexpected floating numbers under the the address. Personalized with either a submarine or aircraft carrier silhouette, the street number you specify, and the color you select. Wall mount. Made in USA. Pay tribute to that family member or friend who serves our country with a navy themed custom-made address sign for your home or business. Perfect for a family that includes someone who is serving or has served on a United States Navy submarine or aircraft carrier. The one-line address sign holds up to four (4) 3" characters, three (3) large 4" characters, or two (2) jumbo 5" characters. Note: the style number visible on the sample signs is for internal use only and is not on your custom sign. Made from sturdy and UV-stabilized non rusting laminated acrylic plastic with engraved personalization.